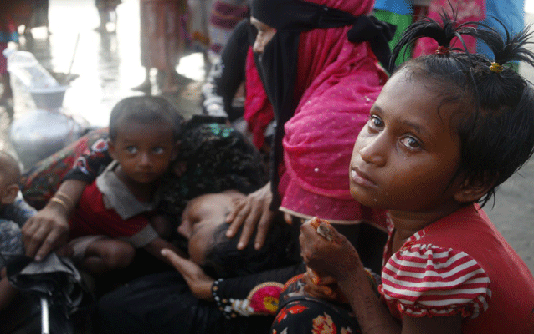 The International Centre for Diarrhoeal Disease Research, Bangladesh (icddr,b) on Friday shared its emergency healthcare response and pre-emptive oral cholera vaccination measures among the forcibly displaced Rohingyas. The icddr,b disclosed this through holding a dissemination seminar at Long Beach Hotel in Cox’s Bazar on Friday, said an icddr,b press release. The icddr,b was very quick to respond immediately during the Rohingya exodus that began in late August, 2017. The icddr,b and UNICEF jointly conducted a field assessment in Cox’s Bazar in September, 2017 and identified the potential risks of diarrhoeal disease outbreak and related mitigation initiatives required. UNICEF supported the study to evaluate the effectiveness of oral cholera vaccine administered among the forcibly displaced Myanmar nationals. The resulting work, which prevented a cholera outbreak, has been described as ‘The most successful pre-emptive campaign’. Dr Tahmeed Ahmed, senior director of Nutrition and Clinical Services (NCSD) at icddr,b briefed about the icddr,b-UNICEF partnership to strengthen acute watery diarrhoea treatment and preparedness initiatives, which include training of doctors, nurses, para-medics and community health workers of the Government and NGOs working in the area. The initiatives also include management of diarrhoeal disease and associated malnutrition through five diarrhoeal treatment centres (DTC) in Leda, Shyamlapur, Balukhali, Teknaf and Ukhia of Cox’s Bazar and DTC-based diarrheal diseases surveillance. In the seminar, Dr Azharul Islam Khan, head of hospitals at icddr,b highlighted the implementation process and experiences in community engagement and the vital role connecting with all elements of the community plays in successful dissemination and implementation. Dr ASG Faruque, senior scientist of NCSD at icddr,b presented on the DTC-based diarrhoeal disease surveillance activities which included the recognition that Cox Bazar was a cholera hotspot and sanitation facilities in the camp created an environment ripe for cholera outbreaks. He reported that a total of 820 healthcare professionals have been trained by icddr,b on management of diarrhoeal disease and the diarrhoeal treatment centres have provided care to 6,156 patients comprised Rohingya and host communities. The release said that some 706,364 people were forcibly displaced from the Rakhine province of Myanmar and took shelter in Ukhiya and Teknaf upazilas of Cox’s Bazar since the exodus started in late 2017. Initially, there was huge shortage of basic water, sanitation and hygiene components and the Rohingyas were in threats of various enteric infections including cholera. The government of Bangladesh with technical support from icddr,b and other partner organisations undertook a massive oral cholera vaccination campaign in Teknaf and Ukhiya upazilas. During October in 2017 to December in 2018, four rounds of vaccination campaign took place administering 2.2 million doses of oral cholera vaccine among the Rohingyas and host community. Dr Ashraful Islam Khan told the audience that the pre-emptive vaccination campaign has prevented an epidemic of cholera in Cox’s Bazar, which was highly anticipated by the global public health community. Civil Surgeon of Cox’s Bazar Dr Mohammed Abdul Matin, Health Sector Coordinator Brig General (Retd) Dr Balwinder Sing and National Consultant at UNICEF Professor Dr Be-Nazir Ahmed also spoke on the occasion. Besides, representatives from the World Health Organisation (WHO), UNICEF and other stakeholders attended the seminar.